In my household, we have been trying very hard to eat better. This means not following my husband’s family rule of having no less than three desserts. This also means trying to do a bunch of cooking on Sundays to make healthy recipes that can take us through our busy week and not resort to pizza and poppers. With the main chef in the house (me) slightly out of commission due to elbow tendinitis, there is a new chef in town (my husband Paul). This is new to him and needs lots of direction from me but he has reportedly enjoyed doing some of this cooking, especially the oatmeal chocolate chip cookies from Super Bowl Sunday. This past Sunday we had a 3-hour cooking marathon with me teaching and included Paul trying to get me to NOT help, which was VERY difficult and not very successful. This is our own recipe that we make to have for breakfast during the week. Pepperoni, or sausage that has been browned (1 cup or so). 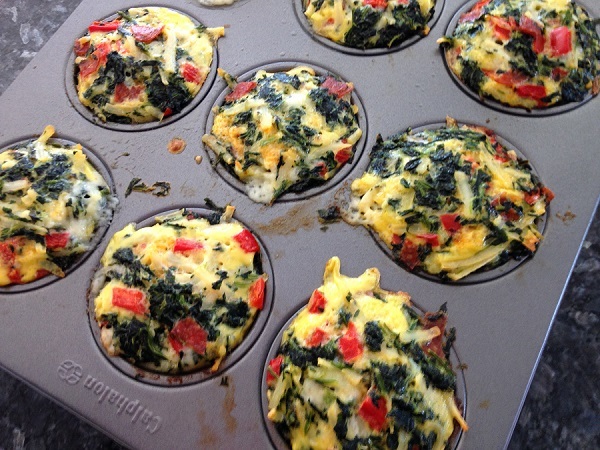 Mix it all up, divide among a 12-cup muffin tin (coated with cooking spay). We eat 1 1/2 muffins as a serving. Very healthy, especially if you use turkey sausage, and along with some fruit, a pretty filling breakfast. 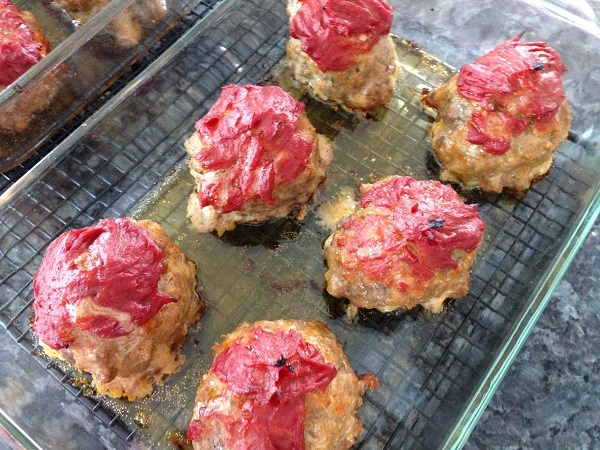 Recipe #2: Tomato-Glazed Meatloaves from Smitten Kitchen. This one had quite a few steps but it was worth it. Deeeeeeelicious! (even though I forgot to tell the chef to put the milk in the mixture, so they were a little teeny tiny bit not as moist/tender….) Have I told you how much I love recipes from smittenkitchen.com? We did NOT make the accompanying brown butter mashed potatoes that are in the recipe since we were trying to keep it healthy and all, but they look delicious too. Recipe #3: Chicken Noodle Casserole… Sorry, no picture of this one! We thought about it, but decided against it because it was really BORING. It is tasty – tastes just like thickened chicken noodle soup. But, we used whole grain egg noodles, and didn’t put the buttered breadcrumbs on it in order to make it healthier, so it pretty much just looked like brown noodles. But good. 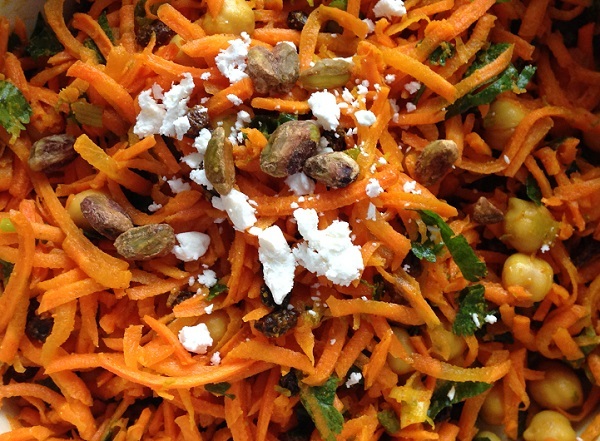 Recipe #4: Marakesh Carrots from Joy the Baker. This one was totally for me. Paul will not get within 10 feet of something with turmeric, cilantro, chick peas, pistachios or scallions! I’ve made this before and I just love it. All healthy ingredients and a dressing with not a ton of oil but LOTS of flavor. Lastly was a huge green salad to keep in the fridge. 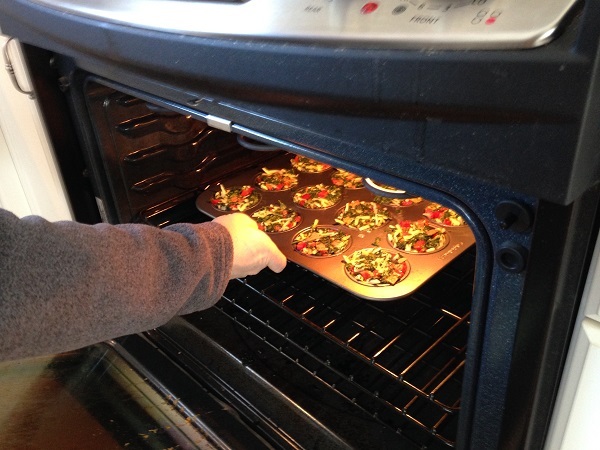 We were then set for the week with a bunch of healthy recipes, and tired of cooking/directing! By the end of the week, we’ll get pretty tired of eating these recipes multiple times, so that give us incentive to look for something new and different. Or decide to freeze some of them next time. Do any of these look good to you? Would you try any of them? Posted in Uncategorized and tagged chicken noodle casserole, frittata muffins, marakesh carrots, tomato glazed meatloaves on February 22, 2017 by lizytish. Great looking recipes Liz. I especially love anything with carrots! Kudos to both you and Paul for making such a commitment to eating healthy. Try the carrots! SOOOOOO good! I have most of the ingredients for the frittata already! I’ll try that first. Interested to try the carrots next. You guys are having an adventure together in your own kitchen! That’s great. Keep resting – that’s an order! I’m definitely resting! Enjoy the frittata! Looks great Liz! I especially like the glazed meatballs. I hope you are fit as a fiddle very soon. Thanks! 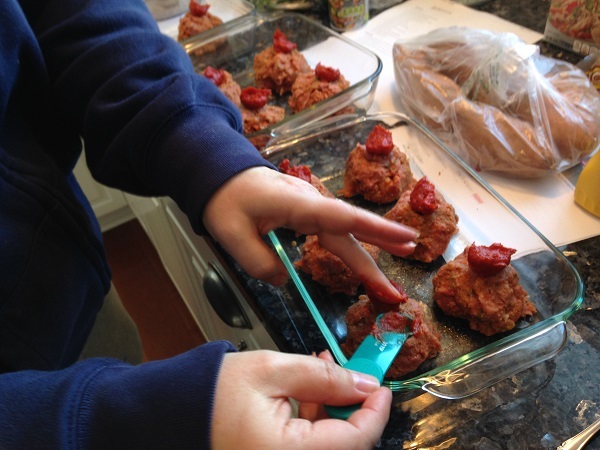 Try the meatballs – so good. I look forward to trying the Marakesk Carrots recipe very soon. Thanks for sharing! 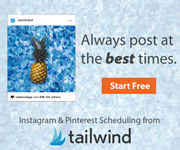 1 Pings/Trackbacks for "Sunday Cooking: 4 Healthy Recipes To Get You Through The Week"